Store-bought food is small potatoes when you can cook at home for Krsna with devotion. Suppose you’ve decided to serve potatoes with your supper tonight. What kind of potatoes will you serve? There are dozens of choices. You could, for instance, go to the neighborhood supermarket and for 79 cents get a one-pound package of Bird’s-Eye Tiny Taters. Then all you’d have to do is spread the frozen, pre-fried potatoes on a baking sheet and pop them into the oven for 15 to 20 minutes (stirring once after 7 minutes). Or, for 19 cents, you could get a pound of fresh potatoes instead and make tikkis (pronounced “teekees”), pan-fried potato patties. Just as you see cooks making pizzas in pizza-parlor windows, if you ever go to India or even to a quaint Indian restaurant in a Western city you’ll probably see a cook making tikkis. He’ll make them just as cooks before him have made them for centuries. First he’ll spice and shape a two-inch round potato patty. Then he’ll place the patty near the center of a large, flat, heavy iron griddle and let it cook ever-so-slowly while he shapes more. When the frying tikki forms a paper-thin brown crust on the bottom, he’ll turn it over so a crust forms on the other side. Finally, he’ll scoot it to the edge of the griddle, where it will stay thoroughly soft and warm—a delightful addition to any supper. No doubt shaping and frying tikkis is going to take you more time than baking what’s inside some frozen package. But at least you won’t have to eat the disodium dihydrogen pyrophosphate that the frozen food manufacturers add to preserve the color of their product. You also won’t be eating their hydrogenated soybean or palm oil and a few other curious ingredients. What you will get from eating fresh cooked potatoes is quite amazing. After years of scorn and neglect, the common potato today is winning plaudits for being an excellent source of nutrition. Six ounces will give you almost half the vitamin C you need each day, and potato protein contains all the amino acids essential to nutrition. Potatoes provide thiamine, riboflavin, niacin, iron, calcium, and phosphorous—all for only one hundred calories (and no fat). The potato is also one of the cheapest vegetables available; it’s a staple for the needy and, in the case of tikkis, a delicacy for the gourmet. Tikkis are just one of the options you have in preparing fresh potatoes. For tikkis, first you mash the potatoes, but you can also cook potatoes whole or shred, cube, slice, or dice them. Tikkis are pan-fried, but you can also bake, steam, saute, or stew potatoes. You can stuff them. You can combine them with one—or more—of fifty other vegetables. You can spice them so they’re hot, pungent, salty, bitter, sour, or slightly sweet. You can cook them with grains like rice or semolina. You can garnish them with milk products like butter, cheese, yogurt, or sour cream. And you can serve them along with any number of other foods. That’s just a few of the alternatives you have for just one vegetable! Devotees are not exaggerating when they say that an expert cook can prepare hundreds of thousands of dishes without using meat, fish, or eggs. And, like tikkis, each dish is both tasty and nutritious. If you’re a Westerner, chances are you’ve eaten meat all your life and you think it’s necessary—if not for its protein (amply available from nonmeat sources), then at least for its taste. But if you try cooking and eating a varied vegetarian diet—dishes prepared with fresh vegetables, whole grains, milk products, and fruits—I’m sure you’ll find what we’ve found: nonvegetarian food isn’t even missed. Of course, vegetarian food that’s been processed, cooked, frozen, packaged, stored, and shipped is still vegetarian. 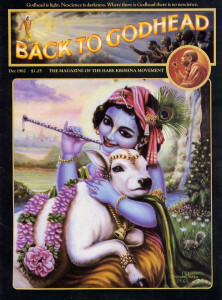 But whether it will be satisfying to Lord Krsna and to you is another question. So between tikkis and Tiny Taters, we resoundingly vote for tikkis. Try them and see what you think. One of the best things about tikkis is that you can cook them without giving them much attention (just one quick turn every fifteen or twenty minutes will do), so they make for truly effortless light meals. But they’re also ideal for feast-sized dinners, since they give you lots of time to make other dishes. 1. Boil the potatoes until they’re tender and then peel them. While the potatoes are still warm, force them through a potato ricer or a coarse sieve to produce a smooth mass of mashed potatoes. Cool the potatoes to room temperature and add 2 tablespoons of ghee or butter and then the salt, pepper, and nutmeg. Then knead the potatoes until all the ingredients are evenly distributed. 2. Add the remaining ingredients (except for the ghee or oil) and knead until they’re mixed well. Divide the mashed potatoes into 8 balls of equal size and then shape each ball into a flat, round patty about 2¼ inches across and ½ inch thick. 3. Brush a well-seasoned heavy iron griddle or a nonstick finished 10- to 12-inch frying pan with just enough ghee or vegetable oil to prevent the potato patties from sticking. Turn the flame down as low as possible and cook the tikkis about twenty minutes on each side, or until a thick, crisp, golden-brown crust forms. Hasty cooking or too much ghee or oil will cause the delicate patties to break apart. Offer the tikkis to Krsna when they’re still hot, with a sprinkle of savory tamarind chutney or a dob of zesty tomato sauce, seasoned yogurt, or fresh green coriander-mint chutney. Prepare as directed above, but omit the turmeric powder. Instead, add 1 to 2 teaspoons horseradish root that has been pureed or grated fine. Prepare as directed above, but omit the turmeric powder and the minced ginger and chilies. Instead, add ¼ teaspoon powdered red chilies and 3 tablespoons toasted cashews, almonds, or peanuts that have been chopped fine. Prepare tikkis as directed above, but omit the turmeric powder. Instead, add 1 teaspoon dry-roasted cumin seeds that have been coarsely crushed and 1 small firm ripe tomato, diced fine. Step 1 of the previous recipe. 2. Steam the peas until they’re tender. Then place them in a small bowl and mash them into a coarse wet pulp. Over a medium-high flame, heat ½ tablespoon of ghee or vegetable oil in a small saucepan until a drop of water flicked into the pan sputters instantly. Add the ginger root, chilies, and asafetida to the ghee or oil and fry until brown. 3. Stir in the peas, salt, garam masala, cumin seeds, and sugar, and cook until dry. Remove the pan from the heat and add the lemon juice. Now cool the spicy mashed peas and shape into 10 equal portions. 4. Divide the potato pastry into 10 patties of equal size. Place a portion of mashed peas into the center of each patty and then fold the edges together so that the peas are in the center of the potato casing. Now gently flatten the patties so they’re each 2 ½ inches across. 5. Put a teaspoon of ghee or oil into a 12-inch heavy cast-iron pancake griddle or frying pan and heat over a low flame for 2 minutes. Carefully place the patties on the griddle or pan and very slowly brown them on both sides until they form a golden-brown crust (about 15 minutes per side). Offer the tikkis to Krsna hot, with a twist of lemon or lime or a dab of fresh chutney. 1. Peel the yams and steam until tender. Mash them and mix in the remaining ingredients, except for the ghee or oil. Knead the yams until the ingredients are thoroughly mixed in and the yams are smooth. Now shape into eight round patties of equal size. 2. Put the ghee or oil in a heavy 12-inch cast-iron griddle or frying pan and heat over a low flame for about 2 ½ minutes. Brown the patties on each side until they form a nut-brown, slightly crisp crust. 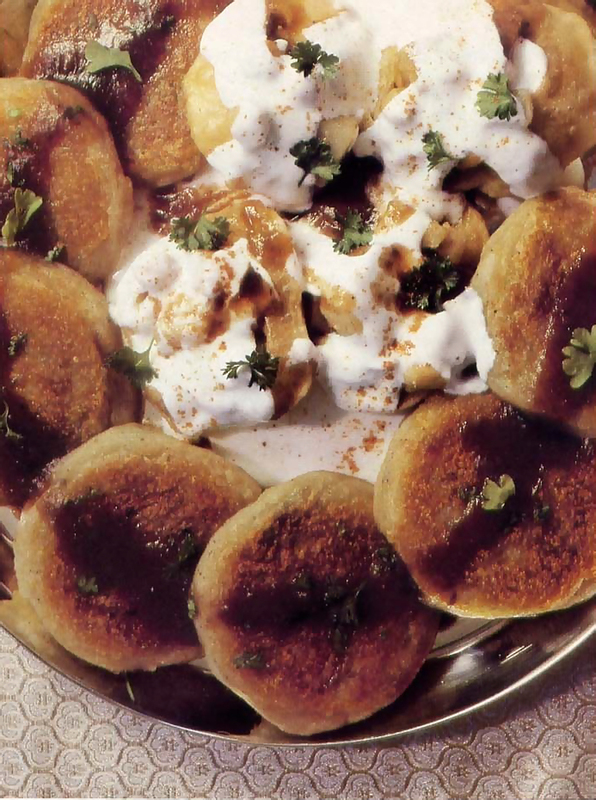 Serve the tikkis to Krsna while they’re still warm, with a dab of fresh moist chutney or wedges of lemon or lime.